Most Canadians are unaware of what constitutes too much debt, and to be fair there is not one simple answer. Most people will say that your level of debt should be equal to the risk that you are willing to carry. The more debt the higher the level of risk. Most financial institutions in Canada will not lend you money if you are already using 40% or more of your monthly income to pay for your current debt. This is called your total debt service ratio (TDSR). However, how much debt is too much really depends on the individual. Only you know when you are outside of your comfort zone when it comes to your debt. If your monthly debt payments are leaving you with little to no extra cash at the end of the month – you are probably carrying too much debt. So how does the bank tell if you have too much debt? As mentioned above they can use your Total Debt Service Ratio, which calculates your total secured & unsecured debt as well as your property taxes divided by your total household gross income. This allows a banker to see what percentage of your gross income is going towards servicing your debt. If your total TDSR is greater than 40% the bank will not lend you money as they believe too much of your income is going towards servicing debt and there is a high likelihood you will not be able to pay your debts at a sustainable rate. Does that mean a TDSR of >40% is the threshold? Not necessarily. This just means that at this level the bank has determined that too much of your monthly income is going towards servicing your debt and therefore does not want to increase this number. If they do there is an increased risk from the bank’s standpoint. Bank’s traditionally have a low tolerance for risk. See how your debt stacks up to the average Canadian. Use the graphics below to benchmark yourself and see if your debt is above, below, or about average. The following is a breakdown of the average consumer debt by age, city, and province (excluding mortgages). All data is from Equifax and compiled by CBC. 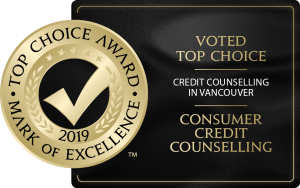 If you are concerned with your level of debt please contact us for a free consultation, or check out your various debt options. You can become debt free, we are the first step in that journey. Start today!